I am often asked when is the best t ime to plan a spring snow goose hunt. The easy answer to that is whenever you can get out. That being said in the past 10 years spring snow goose hunting has changed tremendously. With the biggest change being the amount of pressure these birds see on a daily basis. This means planning your trip early in the year is critical to your in field success. Snow Goose Hunting pressure has changed everything! When the conservation order first started land access in the spring was much easier to come by. Planning a trip was as simple as getting the time off work and chasing the birds down, finding a hot feed, and asking the farmer to hunt. This style of hunting is harder today because random land access is harder to get these days because more of us spring snow goose hunters and guide services exist today. My suggestion on how to deal with this is to change up your style hunt to a traffic hunt. When I say traffic hunt I mean setting up in a specific location based upon a general flight pattern and not based upon seeing a bunch of geese feeding or roosting in that spot the night before. For a traffic hunt to work you need a plan. A plan based on location, weather, and equipment. Once you have a plan, you work the plan on your hunt and you will have success. I like to say “Plan the work and work the plan”. A good traffic spot is in an area with a good number of snow geese migrating over it that is within 10-20 miles of a known refuge area that publishes bird counts via the internet or a telephone recording. Most of the big refuges have bird counts done on them. You do not want to be too close to the refuge as all the refuge geese will fly over you going out to feed each morning. I also prefer to be on a high spot for visibility or in a spot with some water. Something unique is always good. And one last tip…try to get away from other decoy spreads. It’s better to be in a spot that has 20 flocks of geese fly over it each day that has not seen a decoy spread that morning than being the 20th spread that 100 flocks flew over that day. Initially finding a good traffic spot takes the usual scouting time and knocking on doors as usual. But once you find one of these gems and secure permission, treat the farmer like gold and try to develop a relationship where you can call them each year to secure permission again. Flight patterns generally stay the same each year only to very with timing and snow lines so keep a log each year on when you hunted, refuge bird counts, and weather. Once you have one of these traffic spots lined up timing your hunt (assuming your work schedule is flexible) is most often done behind a computer once you know generally when the geese move through an area. Watching refuge counts and the weather is key. I like to hunt the mid to back half of the migration and prefer south winds and sunny skies to bring new geese into an area. It’s amazing how the same geese that can be hard to decoy in one area can move north to the next staging area and become more decoy friendly for the first few days in an area. You have to hunt when you can, but if you can be flexible and hunt the nice warm days in the spring you will decoy more birds! 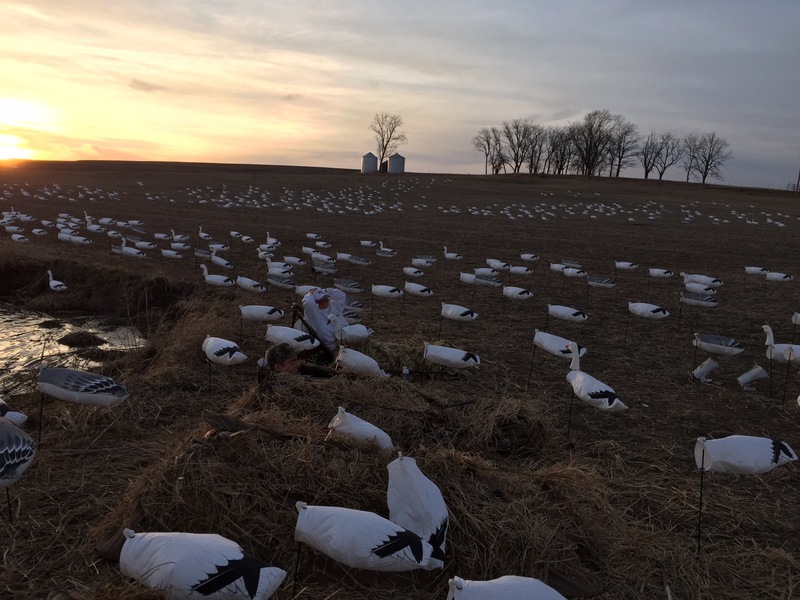 Use these tips to plan your spring snow goose hunt each year and you will enjoy more success!